Retailer In-a-Box, MXP Mobile Edition is a complete Point of Sale and event management solution on an easy to use mobile device. The ability to complete transactions, print and email receipts, monitor inventory, and manage business outside the four walls has become a necessity for retailers. With everything ready to go right out of the box, this solution will enable real time tendering and create more personable and friendly customer interactions, improve staff efficiency whether in a physical store, at an event, customer location or trade show, maintain better control over inventories, reduce the time customers wait in line using mobile POS lanes, save on equipment costs and use your floor space more efficiently. 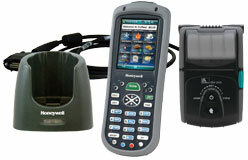 Retailer In-A-Box, Mobile POS, Includes: Honeywell 7600 Mobile Computer, Zebra EM200 Mobile Printer, and New West MXP Software.